is a very complex device composed of gears and which remains very mysterious. Archaeologists recently succeeded in deciphering some of its inscriptions, revealing the secrets of its use. More than 100 years after its discovery, what some call the first computer in the world is revealed a little more. 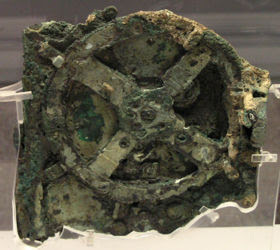 The antikythera Mechanism was discovered in a wreck off the coast of the Greek island of the same name. Since then, its gears have been fascinating scientists. Archaeologists estimate that the machine was used more than 2,000 years ago, around 200 BCE, according to a study published in 2014 . Its inventor as well as the place where it was created remain mysteries on the other hand. In studying it, specialists have determined that this ancient analogue computer was used as an instrument for studying the stars. Even though its functioning was broadly understood, many questions remained unresolved. Questions that could be answered today thanks to 10 years of work carried out by an international team of researchers. On the machine is a text whose inscriptions have been greatly degraded by the years spent under water. For years, these words have remained a mystery to scientists but Mike Edmunds of Cardiff University argues that he and his team managed to decipher no less than 3,500 characters.
" Today we have texts that we can read like the ancient Greek, what we had before looked like something going on the radio with lots of interference ," said at a conference Alexander Jones , Professor at the University of New York. The letters, some of which are barely 1.2 millimeters high, are engraved on the inside but also on the front and back of the mechanism.
" It's a lot of detail for us because it comes from a period when we know very little about Greek astronomy and virtually nothing about technology ," he added, taken by Phys.org . " So these tiny texts are a very important thing for us ." And the inscriptions have actually brought new knowledge about the mysterious machine. Predicting the position of the stars and the future? They confirm that the machine was used to predict the position of the Sun, the phases of the Moon and the planets of the zodiac. But it was not a research tool, according to the archaeologists, it was rather a device for teaching. However, another discovery intrigues. The calculator was also used to predict the color of eclipses, which has a divinatory purpose.
" We are not sure how to interpret this to be honest, but it could be linked to some sort of omen. Some colors could be better auspices for future events than others, " says researcher The Independent . Before the discoveries on the machine, experts thought that such a technology appeared only 1,000 years later. Although state-of-the-art technologies such as X-ray scanners have made it possible to decipher the signs, the production site of this machine remains hypothetical. Scientists argue that the island of Rhodes could be the center of creation. This technology could even be rather common at this time for cultivated people, they suggest. Indeed, two styles are present on the inscriptions proving that at least two people would have worked on them. New explorations will perhaps bring the sequel of the pieces that could complete the inscription studied. Scientists estimate that they currently own only a quarter of the text. Hope to better understand the role of these very complex gears.